We live in a city. On our street, if anyone backed out of their driveway haphazardly they would either hit their own house or their neighbors. It’s cozy. My commute to work is 100% in-town. So the insane amount of contact I’ve had with wildlife makes me shake my head and proclaim to be on safari on a regular basis. I took the trash out and got barked at by a squirrel. It popped right up on top of the fence not two feet away from me and barked. Nor chattered, squeaked or clicked at me. It barked. Like the neighbor’s dog, but with more passion. I have had to stop and wait on rabbits, geese, deer and children to cross a very busy street. A stray cat in the neighborhood decided that we aren’t able to hunt for our own food and left us a dead chipmunk. When we didn’t graciously accept the offering and grill it for dinner, the cat took it back. I pulled into the driveway last Friday night and shined my headlights on a very large opossum stationed at my garage (potentially considering taking up residence inside). Not knowing a thing about these creepy creatures, I kept my headlights fixed on it, hoping it would go away so I would feel comfortable getting out of my car. It did, but not after staring eerily at me for awhile. 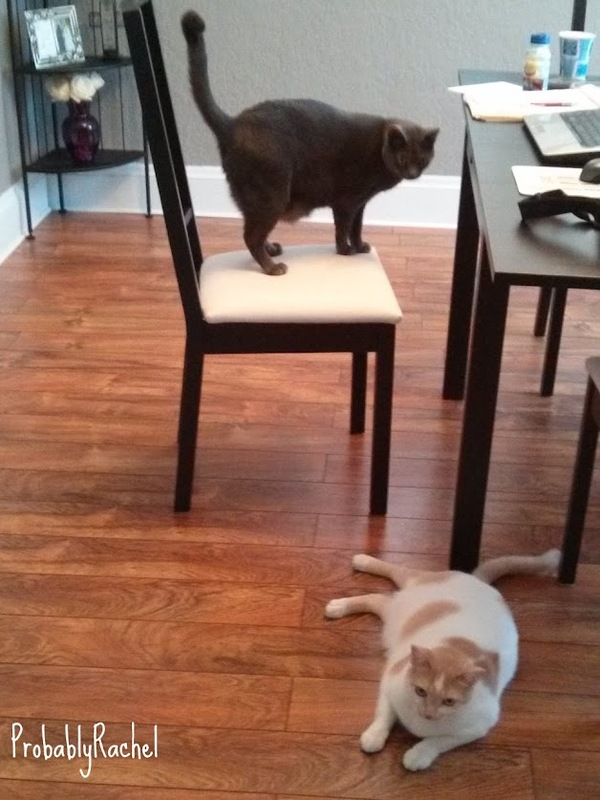 There are many reasons why Holmes and Watson are indoor-only cats. And they are not limited to keeping them from being hit by cars on our street. I’m pretty sure that my barking squirrel could even be a threat. In college, I spent a couple of summers living with my aunt and uncle. My aunt used to tell me every time before I left, “Be careful! Watch out for bears, deers and ducks!” I was supposed to watch out for ducks because there were a lot of them around the creek behind their house and I used to feed the ducklings. I was supposed to watch out for deer because I got hit by a deer one evening on my way back from work (I did not hit the deer, it hit me. We were both fine). And finally, one year a student at a nearby high school hit a black bear on the route that I frequently took. I don’t think we can extend the “Watch out for” list to include all of my new creatures. What kind of wildlife have you encountered recently?